Surprise someone special with this six-box tower of delights. The gourmet treats inside include our extraordinarily juicy Royal Verano® Pears, dense chocolate decadence cake crafted in our bakery, and silky chocolate truffles from our candy kitchen. 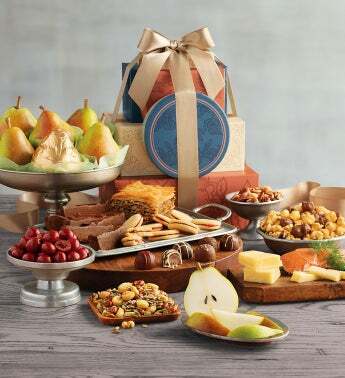 In addition to the sweets, there are savory surprises like delectable smoked salmon and sharp white cheddar cheese. There are plenty of snacks to go around in this impressive tower.